Show Your Spirit! Quantity Discounts For Fundraisers! 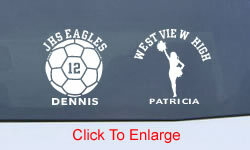 It's always DECAL season no matter which sport(s) you or your loved ones play! Show your team spirit on a car, truck, SUV, garage wall, bedroom or dorm - virtually any surface that is smooth with 7" to spare! We feature 9 sports and multiple designs per category that can all be previewed below. Your custom decal can be made to order in any of the designs shown with your unique text in your choice of 8 fun, long-lasting colors of outdoor-grade vinyl with easy to apply instructions! All sport decals include a FREE individual's name & team name or anything else you'd like to say (15 character limit). We'll also include a FREE team # integrated into the design, however this is not required. So don't drop the ball or miss the pass, be a team player and add a custom-made vinyl decal to your order today! Ordering is easy, secure and we always ship FREE on orders over $6.95! On ALL Sports Decal Orders! Name, Team & Number Included!